Clouds arrived several hours ahead of the forecast Friday evening, 8 February 2019. I decided to go out to the observatory anyway to do some more work with the new 102mm refractor. I set up the new Meade StarPro AZ 102mm refractor telescope on the observatory patio. 1819 MST: LX600 ON, StarLock OFF, High Precision OFF. Viewed the crescent Moon, 102X, through thin clouds. Took this handheld iPhone 8 Plus afocal 102X photo of the Moon. 1826 MST: began using the StarPro refractor for my upcoming review. 1854 MST: finished this evening's tests. 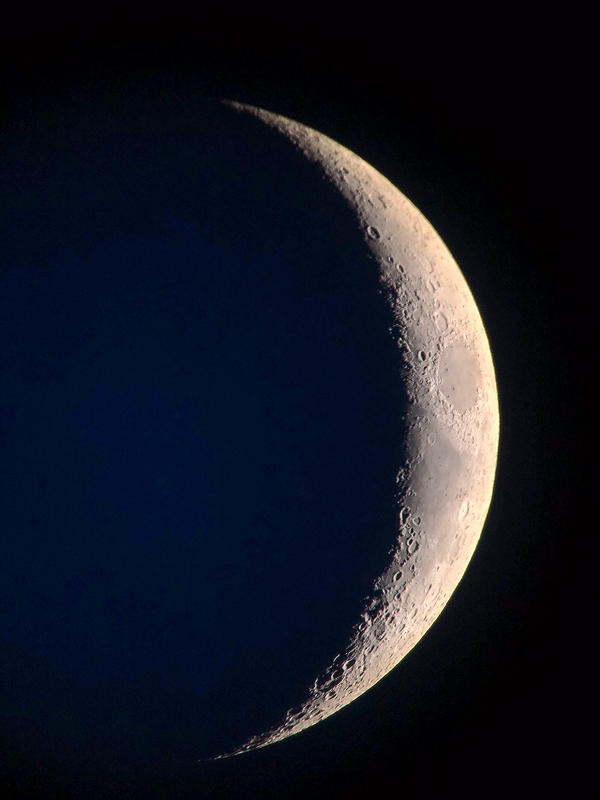 Returned to the 12" telescope and took a last look at the Moon with Earthshine, 102X.